Pretty amazing photo, right? 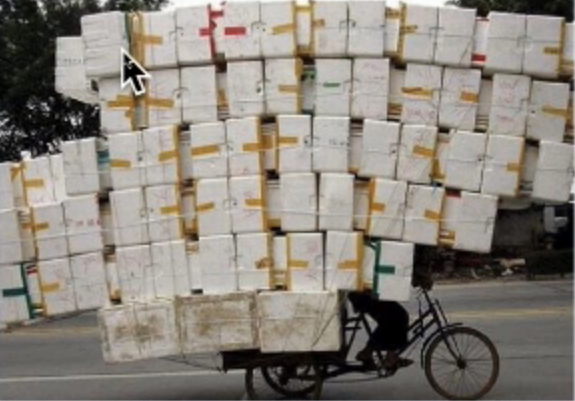 Can you imagine carrying all those packages while riding a bike? This image also represents energetic imbalances that block us from healing and being truly well! Think of each package in the picture as an energetic imbalance. One might represent a trapped emotion, another a psychic trauma, another a misalignment…you get the idea. In getting to the root causes of issues it takes time. Each Body Code session allows one to get rid of more “packages” or imbalances. With chronic issues, there will be lots of imbalances that have collected over the years that will take time to release. Each session helps to remove a layer. I encourage clients to remain positive and know that with time, things can improve and get better. I am humbled to be able to assist in your healing. With the Body Code I have seen remarkable improvements in so many areas both in my personal life and the life of others. Thank you for allowing me to be part of your healing. I also highly recommend TSEnergyWorks.com for more help along the same lines. This healing has been an instrumental part in healing my BRAIN of depression and anxiety.